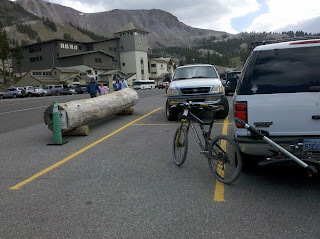 I first visited the Mammoth Mountain Bike Park back in 1995. Up until then all my mountain biking had been done in Chino Hills State Park, and other local Southern California locations. 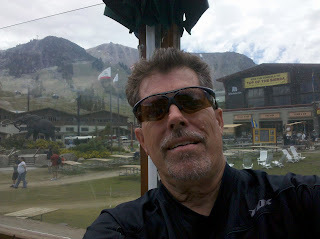 I had heard about the bike park built on the ski slopes of Mammoth Mountain Ski Resort a short time before my visit in 1995. Previously my family had spent many winters dating back to the early 70's skiing at this resort, and occasional summer trips to relax and play tennis. In 1989 I took up the sport of mountain biking, then in its infancy. All bikes being made had NO suspension. In the succeeding 21 years the technological side of this sport has exploded. High end mountain bikes can cost upwards of $6,000. Over the years since 1995 I have returned to the bike park with friends several times each summer to ride the 70 miles of single track trails. On a typical day we log almost 30 miles of riding downhill in the park. 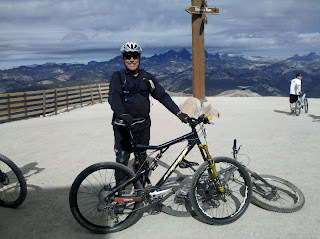 This past Friday, August 20th, I left home around 11am to drive up to Mammoth Mountain to meet friends and ride. Last summer (2009) was the first summer in years I didn't ride at Mammoth. We spent most of the summer getting to know our Newell, and took a number of trips. In addition I injured my left achilles tendon backpacking in the Eastern Sierras in late July. Ultimately I was not able to ride my mountain bike due to this injury for over 10 months. Finally, this past June it had healed and I began training on my stairmaster to start riding again. Two weeks ago I rode in Claremont Wilderness Park and was pleased with my progress, and no pain, so I decided to join my friends this weekend at Mammoth. We started riding Saturday, August 21st, around 9:30am, and finished around 4pm having logged 29 miles. The weather was great.....low 70's and partly cloudy. Next adventure......off to Ventura, CA for the Labor Day weekend in the Newell.....story and pictures to follow! Thanks for reading! 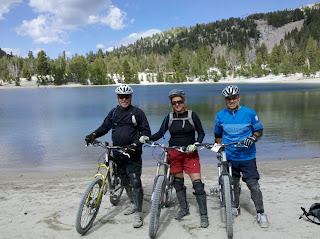 -On August 20th we head up to Mammoth Lakes to play in the Mammoth Mountain Bike Park for a couple of days. They have built (many years ago) a 70 mile network of what mountain bikers call "single track" trails all over the mountain. The two highest trails start at the 11,000 foot mark. -On September 3rd we head to Ventura, CA to spend Labor Day weekend on the beach. This is a continuation of a family/friends tradition of gathering together on the 3 major holidays during the summer. You will recall we met at Rancho Jurupa over Memorial Day, then at Yucaipa Regional Park over 4th of July, and now Ventura. -On September 15th we fly to Seattle, WA to visit our long time college friends who have lived on Whidbey Island for the past 11 years. They have a beautiful home on the side of a hill near Coupeville overlooking Saratoga Passage on Puget Sound. -Finally on October 8th we head to Santa Fe, NM for 8 days of exploring this historically rich area of the Southwest. Amazingly we have never been to Santa Fe before.....not even through it on our way to some other destination. We'll be meeting some of our Newell friends there. I'll post more details about each adventure complete with pictures as we move through our travel checklist over the next 60 days. Today's date is August 5th. Normally, by the end of June Southern California inland valleys start to heat up into the high 90's, and hits low 100's periodically for a few days at a time, here and there. Not this summer! Typically we have what we call in Southern California "May/June gloom", or, if you will, a heavy marine layer caused by what local meteorologists technically call the "Catalina Eddy" effect. Simply put each evening the marine layer which sits off the coast in the daytime, pushes way inland, yes even to Ontario, California, resulting in heavy overcast each morning until about 10, or 11am. As of today we are still getting that marine layer most days. The pleasant result is a daily high of around 88-90 degrees, and down into the 60's at night....sometimes high 50's. So far this summer we have had maybe 4-5 days of temperatures over 100. Most days it hasn't gotten out of the 70's. This past 10 days it has been steady in the mid to high 80's, occasionally hitting 90 for a couple of hours. I would still expect that we will get our "hot weather" at some point in the next few weeks, however, I was talking with a friend who works at the AQMD (air quality management district) in San Dimas. Their meteorologist told him yesterday that the long range forecast is for the same weather we have now into the Fall. If that happens that would be a first. I have lived in Southern California since I was born in 1949. I don't remember a summer like this, ever! At any rate, we'll see what develops. Our next scheduled outing in the Newell will be over the Labor Day weekend (September 3rd to 6th) when we travel up to Ventura, CA. Just exactly 4 weeks from now! Stay tuned! This past weekend Elaine and I rode our bicycles up to the storage facility where we park the Newell when not in use, and drove it home to do some work on it. The microwave that came from the factory in our Newell was a 28 year old Amana that I am sure would stop someone's pacemaker if they got too close while it was on.....LOL! Elaine wanted to replace it with a microwave/convection unit. They are pretty expensive (about $450 at Best Buy), but I found a "new in the box" GE Profile one on Ebay for $250. It has been sitting in our garage for about 3 weeks, but this past weekend was the weekend to install it. Usually a simple project such as this takes just an hour or so, but knowing how well I am acquainted with Mr. Murphy I allowed for 2 days to switch out the units. Remarkably we had the old unit out, and the new one installed in less than an hour! That left time to fix a couple of other electrical issues, which included a new LED reading light I had installed a few months ago that wasn't putting out the kind of light I was expecting. I finally found a good 12 volt electrical source to tap into that wasn't dedicated to something else already, and got that light working at full capacity. Anyway, that's what's happening in our corner of the world.......13 months 4 days until we retire and "hit the road"....yeah for us!